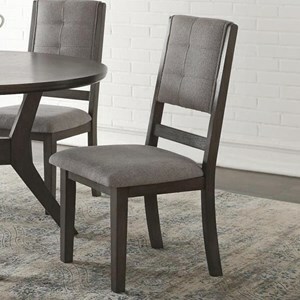 The casual and transitional style of this dining table and chair set creates a stylish yet neutral pallet. 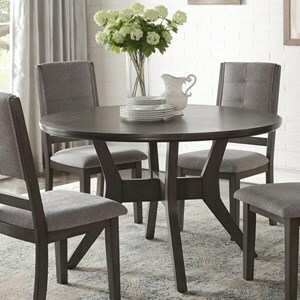 Features such as concave legs and the table top's quadrant pattern provide subtle, refined yet casual style to this round dining table. The side chair completes this set with an extra splash of style, thanks to details such as its biscuit tufted design on the upholstered chair back. The Nisky Transitional Five Piece Chair and Table Set by Homelegance at Hudson's Furniture in the Tampa, St Petersburg, Orlando, Ormond Beach & Sarasota Florida area. Product availability may vary. Contact us for the most current availability on this product. Complete your dining area with this collection's causal yet refined style. Featuring a dark finish over acacia veneers and loaded with transitional style, these pieces are sure to give your home the stylish update you've been looking for. The Nisky collection is a great option if you are looking for Transitional Contemporary furniture in the Tampa, St Petersburg, Orlando, Ormond Beach & Sarasota Florida area. Browse other items in the Nisky collection from Hudson's Furniture in the Tampa, St Petersburg, Orlando, Ormond Beach & Sarasota Florida area.